A few months ago friend Daniela Capistrano suggested that I team up with photographer Bashira Webb. 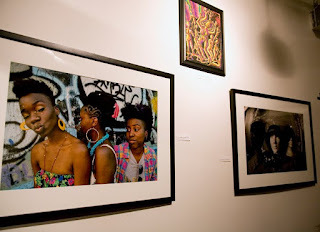 Bashira and I decided to collaborate on a review of Alexandria Lust and Lehna Huie's then-upcoming art show Ladies First, A Celebration of Black Female Expression: Beyond 28 Days. The review was posted at Sadie Magazine today! With an emphatic nod to Queen Latifah, co-curators Alexandria Lust and Lehna Huie challenged the ghettoizing of Black women’s history in their exhibit, Ladies First. Through subtitle alone, Lust and Huie made their mission known: to expand the celebration of Black women’s empowerment and expression past the borders of Black History Month. Ladies First, which opened Thursday, February 3rd at the Brecht Forum, was a multimedia art show with an exhaustive list of participants. On what seemed to be the coldest night of the winter, I walked down West Street against the icy wind blowing off the Hudson and into the Brecht Forum. The art show spilled from a central room in the Brecht to the walls in the front lobby, and curved around the hallways. As I walked in, people were preparing hors d’oeuvres and drinks, and the two curators were sprinting from one room to another tying up loose ends. The buzz of opening night nerves and oh-my-god-I-can’t-believe-we-just-pulled-this-off energy was unmistakable. Read the full review at Sadie Magazine.